Habit: Annual to shrub or small tree, or non-green root parasite, often bristly or sharp-hairy. Stem: prostrate to erect. Leaf: basal and/or cauline, generally simple, generally alternate. Inflorescence: generally cymes, or panicle-, raceme-, head-, or spike-like, generally coiled in flower (often described as scorpioid), generally elongating in fruit, or flowers 1--2 per axil. Flower: bisexual, generally radial; sepals (4)5(10), fused at least at base, or free; corolla (4)5(10)-lobed, salverform, funnel-shaped, rotate, or bell-shaped, generally without scales at tube base, with 0 or 5 appendages at tube top, alternate stamens; stamens epipetalous; ovary generally superior, entire to 4-lobed, style 1(2), entire or 2-lobed or -branched. Fruit: valvate or circumscissile capsule or nutlets 1--4, free (fused), smooth to roughened, prickly or bristly or not. Genera In Family: +- 120 genera, +- 2300 species: tropics, temperate, especially western North America, Mediterranean; some cultivated (Borago, Heliotropium, Echium, Myosotis, Nemophila, Phacelia, Symphytum, Wigandia). Toxicity: Many genera may be TOXIC from pyrrolizidine alkaloids or accumulated nitrates. Note: Recently treated to include Hydrophyllaceae, Lennoaceae. Wigandia urens added, as naturalized. Scientific Editor: Ronald B. Kelley, Robert Patterson, Thomas J. Rosatti, Bruce G. Baldwin, David J. Keil. Habit: Annual (perennial herb), generally strigose to spreading-hairy; fibrous- to taprooted, staining red dye present or not. Stem: branched at base or above, < 5 dm. Leaf: cauline or basal and cauline, 0.5--10 cm, generally smaller tipward, linear to oblanceolate. Inflorescence: raceme- or spike-like cymes, coiled in bud, generally elongate in fruit; bracts 0--many. Flower: calyx lobes fused below middle, 2--10 mm in fruit; corolla rotate to funnel-shaped or cylindric, white or white with yellow area, tube generally +- yellow inside, limb 1--12 mm diam, appendages prominent to minute, white to yellow. Fruit: nutlets generally 4, +- ovate (triangular to +- lanceolate), rarely on narrow stalk or short peg, variously roughened, abaxially generally with central ridge, lateral ridges, cross-ribs, generally tubercled, occasionally prickly or bristly; adaxially keeled above attachment scar, scar on side generally near middle to base, sometimes on bottom or oblique (on angle between side and bottom), generally raised. Species In Genus: +- 65 species: temperate western North America, western South America, northeastern Asia, Australia. Etymology: (Greek: sideways pit, from position of nutlet attachment scar) Note: Nutlet characters in key generally best for 3 nutlets farthest from stem; yellow on corolla changes to white after pollination. Unabridged Note: Fully mature nutlets needed for identification; in many species nutlet closest to stem often more firmly attached, larger, differently textured, and with completely different attachment scar than other 3; nutlet characters used in key focus on 3 more loosely attached nutlets. Intergradation common in some species groups; reticulate speciation in genus; sect. Allocarya often treated as separate genus; many species need study. Corolla size can diminish markedly during flower period. Yellow corolla appendages and, if present, contrasting yellow corolla centers, change to white after successful pollination. Habit: Annual, +- red, staining. Stem: ascending to erect, 1--4 dm; +- red, especially lower; hairs rough, sharp, +- spreading. Leaf: basal in rosette, 1.5--5 cm; cauline alternate; abaxial leaf midveins, margins dark red. Inflorescence: bracts +- throughout. Flower: calyx +- 3 mm, circumscissile, lobes curved over fruit, dense-spreading-hairy; corolla limb 2--2.5 mm diam, appendages pale yellow. 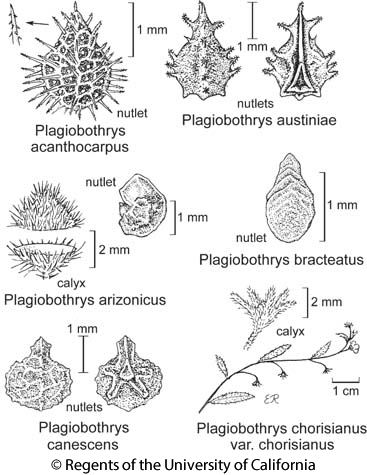 Fruit: nutlets generally 2, +- 2 mm, wide-ovate, arched, strongly attached; abaxial ridge, lateral ridges, cross-ribs narrow, interspaces wide; scar near middle, round. Ecology: Common. Dry, coarse soils in deserts, scrub, woodland; Elevation: < 2100 m. Bioregional Distribution: e NCoRI, s SN, Teh, SnJV, e SnFrB, SCoRI, SW, W&I, D; Distribution Outside California: to New Mexico, northern Mexico. Flowering Time: Feb--May Note: Intergrades with Plagiobothrys canescens var. canescens, Plagiobothrys nothofulvus. Citation for this treatment: Ronald B. Kelley 2012, Plagiobothrys arizonicus, in Jepson Flora Project (eds.) Jepson eFlora, http://ucjeps.berkeley.edu/eflora/eflora_display.php?tid=38485, accessed on April 24, 2019. Citation for the whole project: Jepson Flora Project (eds.) 2019, Jepson eFlora, http://ucjeps.berkeley.edu/eflora/, accessed on April 24, 2019.
e NCoRI, s SN, Teh, SnJV, e SnFrB, SCoRI, SW, W&I, D; Markers link to CCH specimen records. Yellow markers indicate records that may provide evidence for eFlora range revision or may have georeferencing or identification issues. Purple markers indicate specimens collected from a garden, greenhouse, or other non-wild location.